The following is work in progress and has not been ‘Peer Tested’. It is the opinion of one person. If you are experienced and something is wrong, misleading or still missing please make contact with suggestions or input. The intent of this section is to provide information for relative newcomers to the class or anyone feeling a bit overwhelmed by the apparent complexity of the boat. The 505 is actually a pretty easy boat to sail. It is, however, a hard boat to sail really well and win. 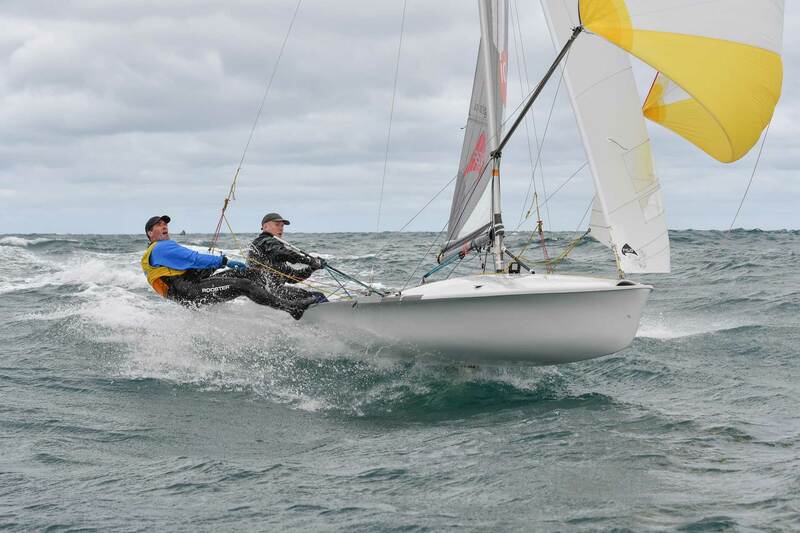 If you work out how to race a 505 you can sail anything. You will have learnt something about ALL aspects of sailboat racing. The first challenge is not to get intimidated or overwhelmed by all the ropes and controls. It is just a sailing boat and sailing is a lot about managing the power you have and matching it as close a possible to the weight you can carry and use as leverage. Power, in turn is mostly a function of sail shape. More power needs fuller sails. If you have too much power you need flatter sails. The controls at your disposal on a 505 are predominantly there to change the shape of the sails and hence control the power. Try not get too distracted by how much or little of a given control you should have. Questions (and answers) like how much or how little rake, vang or Cunningham, rig tension, etc are relative, often have contradictory answers and generally best answered with “It depends”. You will be better served by looking at you sail shape, getting to know how it should look and then finding out how the various controls change the shape. Top sailors often get the same result in different ways. For example there are World Champion sailors who maintain the Cunningham control is the most useless control on the boat whilst others will tell you it is super important in depowering. So keep in mind the fundamentals of sail shape and experiment for yourself. There are often multiple ways of achieving a similar outcome. Of course you have to start somewhere. The good news is there are tuning guides that will give you an excellent starting point for the different conditions. These tuning guides vary a little depending on the equipment and sails you use. One of the Tuning Grids listed in the margin menu should be very useful. Go sailing. Try it out. Have some fun. More vang. Up until the point of needing to ease the main sheet you are or should be controlling mainsail twist by keeping the main sheet pulled on hard. (see sperate note for end boom sheeting boats). Assuming that is the case you need to pull vang on BEFORE you ease the main. Otherwise when you ease the man to stop the boat leaning you will also allow the main to twist too much and lose your height. You need to pull the vang on sufficiently to take over control of leach twist which, until then, you were doing with the man sheet. Cunningham on. This will flatten the sail by bending the mast. Very effective initial power control. Quick to do and easy to reverse for when the wind lessens again. Side Stay Tension. Tightening the side stays makes the spreaders push harder and therefore bends the mast. Bending the mast flattens the mainsail. Main Foot Outhaul. Arguably the least effective control. It does flatten the sail but really only at the very bottom. Rake. The above changes will be sufficient when wind speed has increased a few knots but eventually the wind will get to a point that these changes are insufficient. If the Cunningham and side stays are on tight and you cant pull any more vang on without getting overbend creases in the mainsail but still need to have too much main eased (further out than the inside of the side tanks), then you need to rake the mast. As wind increases further you will rake more and more. Try use Rake as a fairly Macro change. Don’t try change it to often. Better to set it roughly right and focus on the easier adjustments and technique described above. Maybe just have 4 rake positions (eg upright, 1/4 back, 1/2 back, 3/4 back and full rake). The Tuning Grids are ideal for this. Estimate the wind strength and then set the rake as per the Grid. This is because changing rake can be a bit slow and counterproductive to do often. This is beacuse when you do change rake there are a number of other things you need to change as well. Rake is increased by easing the forestay but generally you also need to tighten side stays, ram down and adjust jib sheeting at the same time (explain).